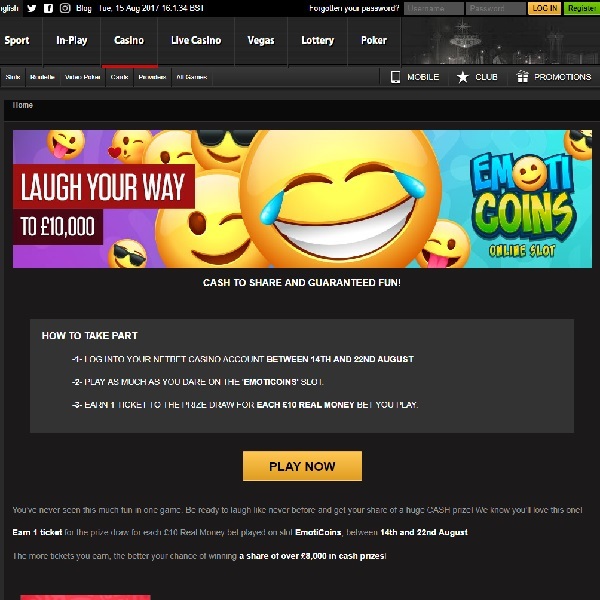 NetBet Casino is giving you the chance to win a share Â£10,000 just by playing on its new EmotiCoins slot over the next few days. Just play the slot at the casino and every Â£10 you bet on it between now and the 22nd August will earn you an entry to the prize draw. There is no limit on how many entries you can earn so the more you play the better your chances of winning. There will be 59 winners from the prize draw. The top prize is Â£875 cash, there will be eight winners of Â£450 and fifty winners of Â£85. This is a great chance to enjoy a new slot and possibly win a huge cash prize. Head over to NetBet Casino today and set the reels spinning on EmotiCoins slot for your chance to win.